Ahead of kicking off a European tour in July, Neurosis have now shared plans to tour North America in August. The metal vets will play 10 shows over 10 days on the continent. 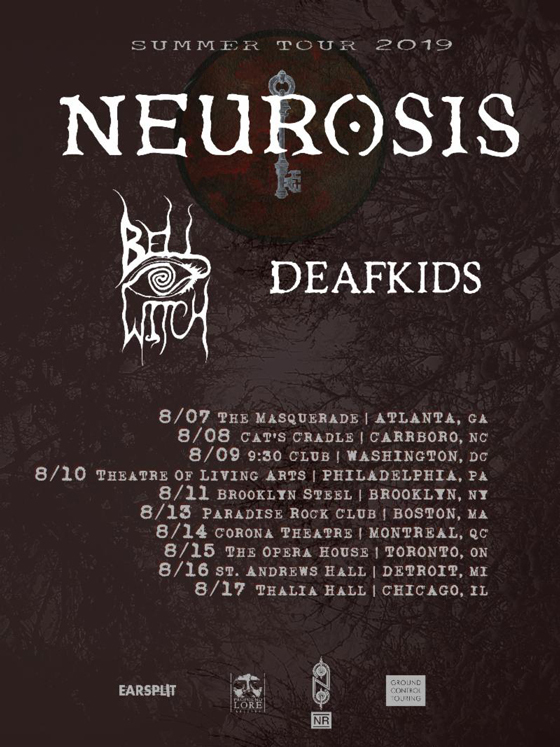 For the tour, they will be joined by Seattle's Bell Witch and Brazilian trio Deafkids. For the latter outfit, the tour marks their first trek through North America. A pair of Canadian stops appear towards the end of the itinerary. The three-band bill will play Montreal's Corona Theatre on August 14, before a date at Toronto's Opera House on August 15. Neurosis delivered their Fires Within Fires LP in 2016, while Bell Witch released Mirror Reaper in 2017. Find the complete North American itinerary below. You can see all the dates on Neurosis' European tour here.